I first started seeing (or started noticing) house-made Vin d’Orange on bar menus in the past few months at places like Penrose and Pizzaiolo here in Oakland and, being a fan of anything slightly bitter, slightly sweet, fragrant and low alcohol, immediately became obsessed. Imagine my unfettered delight when I discovered just how easy it is to make at home, and more happily, that it was smack in the middle of the short-lived Seville orange season, the key ingredient in this incredibly fragrant and refreshing aperitif. 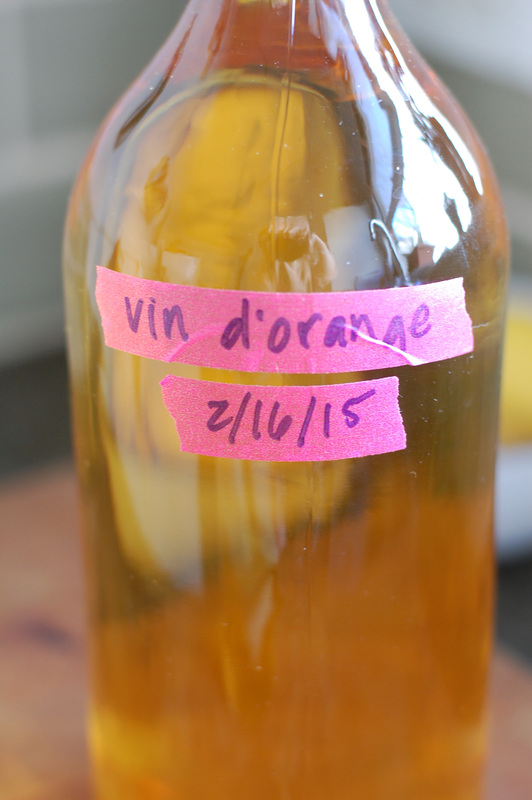 Vin d’Orange is an aperitif wine from Provencal. I’ve never seen it for sale, but considering how easy it is to make, and how high reward it is when you finally get a taste of it, this doesn’t bother me one bit and I plan on making it year after year to save for sipping over ice on the deck of the cabin, or giving out as gifts (but only to very special friends). I thought that this year’s batch was large, but considering how fond I am of the results, next year I plan on doubling it. Time to go to the wine and brewer’s supply store and buy industrial-sized tubs! God, isn’t life super exciting? 5 quart or larger container with lid for steeping, preferably metal, glass, or ceramic. Knife and large cutting board. First, dissolve the sugar in the wine and vodka. Dump everything in whatever container you’re using, and stir until it dissolves. Did I mention the part about patience? This may take a few minutes. Next, cut up all of your fruit and dump it in. I halved mine, then quartered each half. 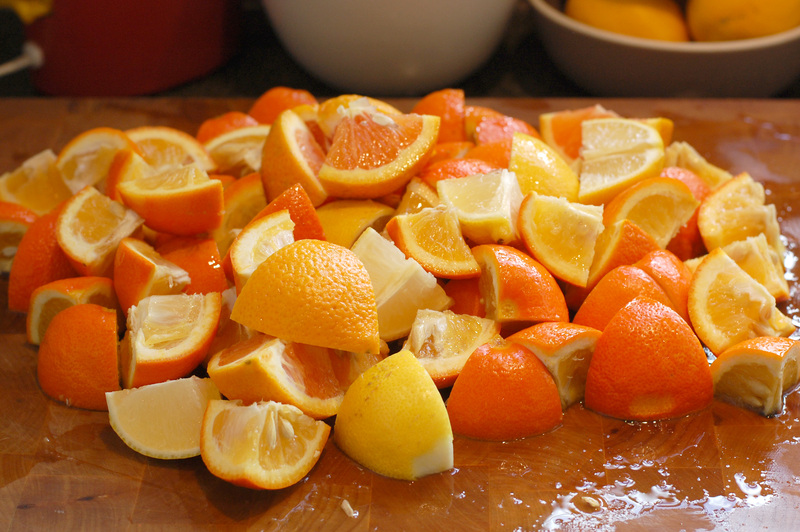 Mine was quite juicy, so be sure you pour all of the juices from the cutting board into your vessel, seeds and all. Oh, be sure you wash it, please! Toss in that vanilla bean and give everything a good stir. Now, just put on the lid, put it somewhere out of the way in your kitchen, and wait. I highly recommend labeling it with the date, lest you forget. Also, if your container is clear, put it in a cool, dark and dry part of your kitchen. The only container I had that was large enough was metal, so I didn’t have to worry so much about the light part. Wait 30 days (patience!). You can stir occasionally if you’re one of those people who can’t leave anything alone, but I probably only stirred once and it was fine. After 30 days, taste it. It should be strong and sweet and a little tart, just like a good lady. Now comes even more patience. Do an initial strain through a mesh sieve to get out the fruit and vanilla bean. Then, strain it all through several layers of cheesecloth or, if you want yours really clear and gorgeous, through a coffee filter. There’s a lot of little bits of residue in the liquid, so if you don’t strain it through the coffee filter it will be a bit cloudy. It’s fine, but not as pretty. HOWEVER – straining through a coffee filter is SUPER SLOW. You’ll have to do this on a day when you’re just sort of sitting around the house with nothing better to do. The filters get clogged easily, so you’ll have to pay attention and change them out when nothing is making its way through. But I think it’s worth it to get such a gorgeous and jeweled final product. Also, I have nothing better to do. Once it’s strained, bottle it! I use the swing-top bottles from Ikea or Container Store, but you can also save those fancy swing-top lemonade bottles or just use old liqueur bottles or wine bottles with corks. At this point, the original recipe says to age it for 4 months or more. However, I think it tastes killer right after straining! I ended up (after some “tastes” and gifts) with two large bottles, and my plan is to drink one straight away and age one. In fact, to bribe myself to save it, I’m telling myself that I cannot open it until the first real warm weekend at the cabin, while I’m sitting on the deck and smelling the pine oils being released by the hot sun in the trees surrounding me. 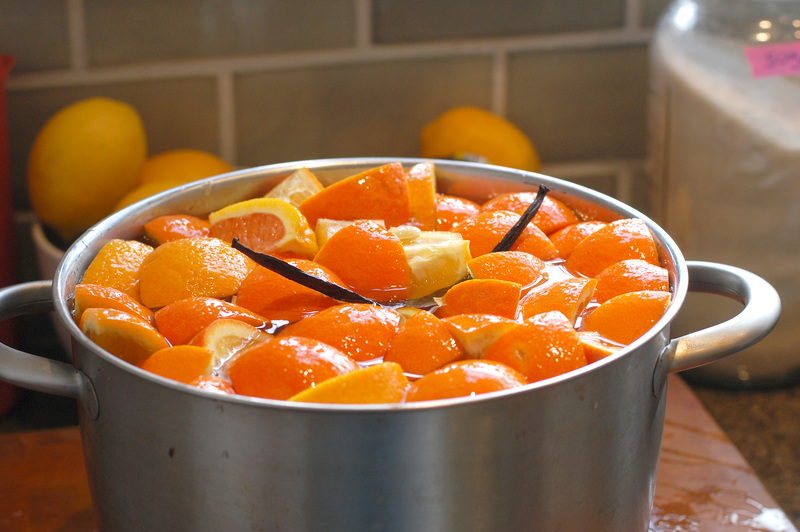 I’ll drink it with a lot of ice and a large slice of orange peel and life will be just about perfect.